Anyway, this entry got started because Kendra's daughter Sarah is visiting her mom here in Sicily for a few weeks. She is now about to enter her junior year in college in Michigan. 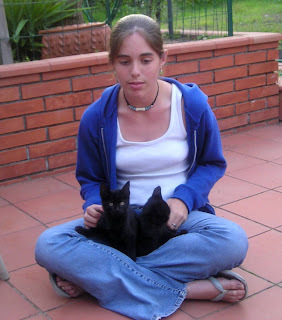 She was the one who held the kittens the day we found them and brought them to my house. We decided to try and recreate the original photo from that day. Pete and Repeat were having NO part of being held quietly in Sarah's lap, though! Ha ha ha, I love all their poses! totally unrelated, but...I have just moved to Sicily (Nicolosi) from London, and I feel that it is my duty to point you in the direction of the Macelleria Paone on the outskirts of Nicolosi (Belpasso side'ish)...they have fantastic meat, especially involtini with things like gorgonzola in them...give it a try. where have you gone? I've been reading this blog for a while because it's my dream to move to Siracusa. Miss your postings!